Wishing every one of you a very Happy new Year! So,the Mayan calendar didn't work after all and we are well into 2013 before even we blinked our eye.Time seems to have flown past without our knowledge,I mean isn't it only few days back we wished each other a Happy New Year,apparently,that was a year back! I have lost count of how many go-to brownie recipes I have these days.For a while I did stick to baking only these but now I am open to any recipe which claims to be rich,dark and fudgy.A while back,when Ria was in town,she gave us a small goodie bag which had a slice of these delicious brownies.I loved the crusty top and soft and gooey insides and fell in love with brownies all over again. Preheat oven to 180C.Grease and line an 8' square baking tin. 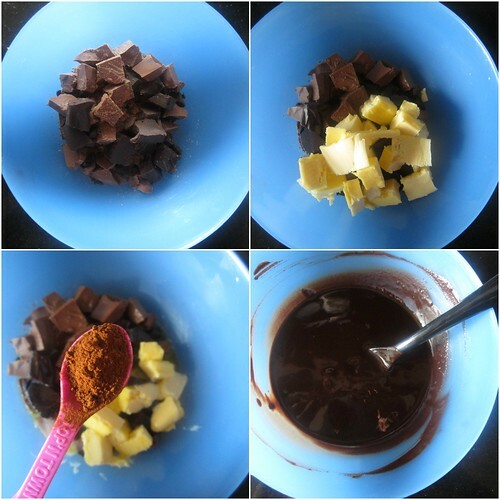 In a micro-proof bowl,melt both the chocolates for 1 minute on full power(alternately,you can follow the double boil method). Mix in the butter and microwave again for 1 minute on full power. Mix in the coffee powder and beat well till you get a smooth glossy mixture.If any chocolate chunks remain,microwave again at 30 second intervals. 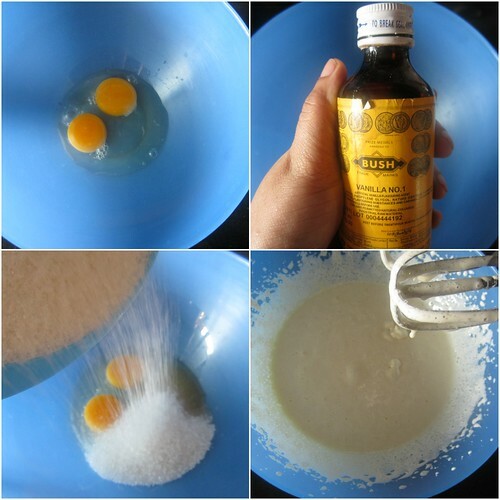 In another bowl,beat together eggs,vanilla and sugar till thick and light in colour. 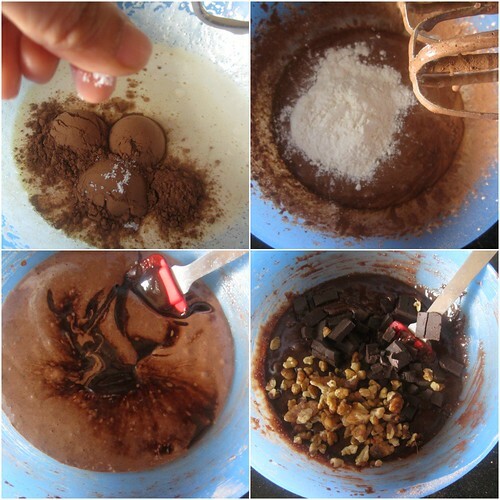 Mix in the cocoa powder,salt and flour to combine. Add the melted and cooled chocolate-butter mixture and stir till you get a smooth,thick batter. Stir in the chopped chocolate and walnuts and pour into the prepared baking tin. Bake for 20-25 minutes or until a toothpick inserted into the center comes out clean.Do not over bake. Let it cool on a wire rack or even better if you can refrigerate it for 30 minutes to an hour and cut it to get neat,even slices. Any mention of Brownie reminds me of my darling niece who flips on the same and thinks "Dipachi'(as she calls me) makes the best brownies in the world.Only kids can think like that,I feel:).No visit to Bangalore is complete without a batch of brownies baked for the darling candy in my life.She celebrates her birthday today and I wish her all the happiness in the world with a huge batch of brownies going her way:). 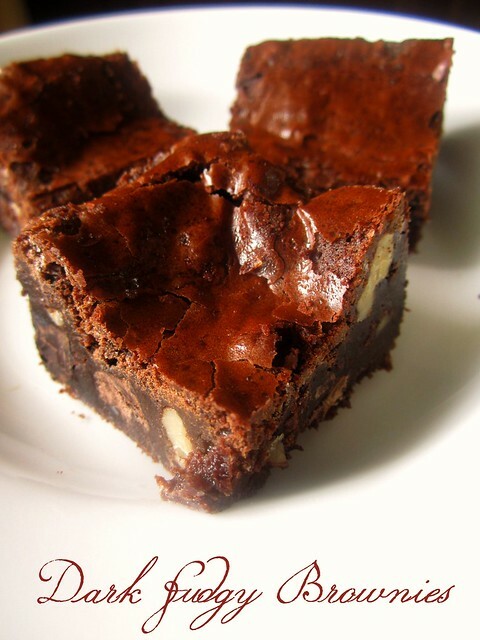 Very gorgeous and delicious brownie..
Omg, killing me with this super tempting brownies,cant resist to it. You said it so right..this one has SIN screaming all over!!! 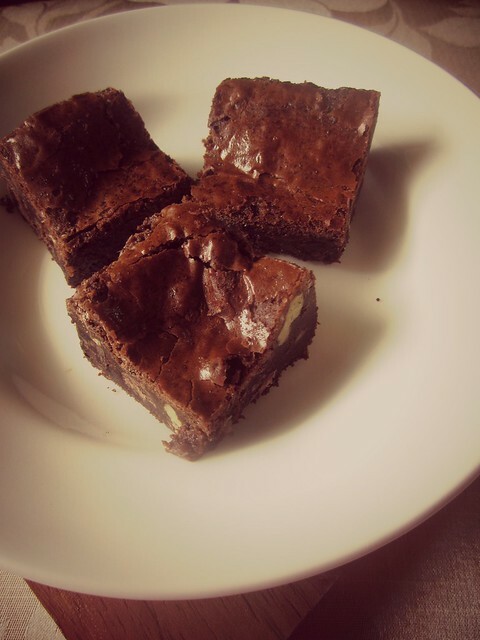 So love (another) brownie recipe from you ;)Keep it coming gal!! Oh, and a very happy new year to you. Nice Crunchy brownies. Would be great with a nice cup of unsweetened coffee! Wish I could grab one right away! Wow! would love to read about your meeting with Ria. Two bloggers I admire so much. What goodies did ya'll get? I so envy you...just kidding. Seriously, I love you gals and the brownies look out so delicious. Lots of love and blessings to your niece. 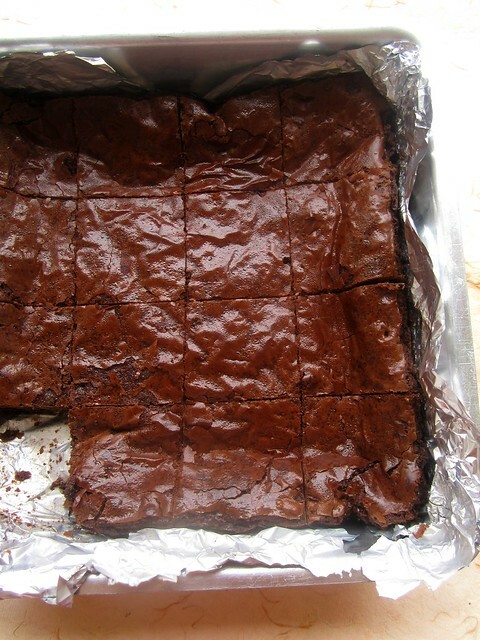 the brownies look so perfect! I mean the top part is flaky and on the inside its soft. good one! happy New Year to you and your family....The fudgy brownies look sooo yummy and gooey on the inside yet so crunchy on teh outside...Nice clicks. Lovd the brownie pics. Had a doubt,cn we make these on stovetop? I am afraid I haven't tried baking brownies on stove top,sorry! Yes you can!When you use the convection mode in the Microwave,it is completely safe to use metal tins since no microwave rays pass through during the convection mode.Go right ahead! Hi, by dark chocolate and milk chocolate do you mean the chocolate compound ?